In an episode of “Manufacturing Talk Radio” recorded live on location at ISM 2018 in Nashville, hosts Tim Grady and Lew Weiss interviewed CreditRiskMonitor President William Danner about the risks associated with corporate bankruptcy. For the individuals and teams trying to monitor for these risks, the challenges are constant and nuanced – and no company is excluded. For evidence of this, look no further than the high-profile household brands that have recently declared bankruptcy: companies like Claire’s Stores, iHeart Radio and Remington Outdoor Company. These firms receive plenty of media coverage, and yet some of their customers, partners and suppliers were no doubt caught off guard by the news. When large companies move towards bankruptcy it is “like watching a train wreck in slow motion,” said Danner. “It's really not hard to see the signs if you're really looking. Click here to watch Manufacturing Talk Radio's interview with William Danner from ISM2018 in it's entirety. Having access to actionable intelligence – preferably automated actionable intelligence – can be the difference between efficiently maintaining a view forward into the future and being completely blindsided by bad news. 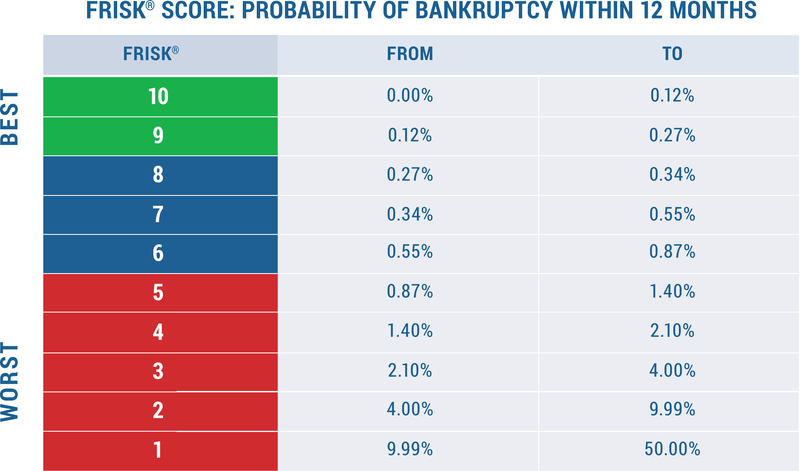 The FRISK® score is CreditRiskMonitor's 96%-accurate read on public company bankruptcy risk. CreditRiskMonitor not only delivers financial risk data that’s accessible with the FRISK® score, it is on the lookout for changes in status and actively alerts the teams leveraging its monitoring capabilities. Bad news is always unwelcome, but it is better to learn of it when it is still a possibility than when it has officially come to pass. Companies usually know what to do when bad news hits, but the sooner they are aware of the need to act, the more response options that they will have to choose from. “Now it's time to do something – it’s time to think about what your alternatives are,” said Danner. As difficult as it is to monitor the financial stress of large, publicly traded companies subject to mandated reporting and industry coverage, private companies present an even greater challenge. Corporate initiatives to increase sourcing from local, small and diverse suppliers do not necessarily anticipate the associated challenge around visibility for the sake of risk monitoring. Less evidence of risk does not mean less risk, and so private companies need to be monitored very differently from their public counterparts. However, with the right information sources (such as trade payment data) and the right analytical model (CreditRiskMonitor’s FRISK® and PAYCE® scores), it is still possible to stay ahead of financial stress and its implications – even with private companies. We all have access to the same overwhelming volume of information, but where are we to begin? Those “in the know” certainly have a proven approach to risk monitoring, one that all companies and users can learn from. There are invisible trends in the clickstreams of active CreditRiskMonitor users – subscriber crowdsourcing – and their pattern of well-informed views and clicks could serve as a credit score all on its own. A quick look indicates little to no concern, while a deep dive with a slow, deliberate pattern of examination is evidence that the user is looking for evidence to support a persistent concern or worry. Incorporating this crowdsourced perspective into the CreditRiskMonitor FRISK® score increases its ability to identify the bankruptcy risk for public companies to 96% within a 12-month period. Risk monitoring is an everlasting commitment of companies with a successful credit culture but the time afforded to professionals for monitoring is finite. Without the support of enabling technology and intelligence, this work can quickly consume all available resources without improving either insight or decision-making. In order to create and defend competitive advantage, companies need confidence in their ability to make decisions. Knowing where the current and rising risks are, and having 24/7 automated monitoring for changes, ensures that everyone is as well-informed as possible when avoiding risk is not an option.